The M2616 Meridian Telephone is a multi-line business phone that is available with a display option. The display option provides additional information and interactive prompts. Use with your Nortel Option and SL1 PBX system. The M2616 is designed for people who require multiple lines and quick access to a broad range of features, as well as the convenience of high quality, built in speaker phone. By adding up to two 22 button Key Expansion Units, the basic complement of 16 programmable buttons can be increased to 38 or 60 buttons for additional lines or access to Meridian 1 features. M2616 Meridian sets are the best solution for versions of Meridian PBX systems that do not support the M3900 series Meridian phones. Note: The display is available as an option. 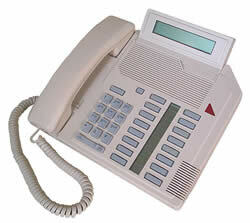 Local telephone companies: Buy Meridian 2616 phone sets at wholesale prices for your rental phones program.